The rains have calmed down the past week or so. That doesn’t mean that the roaring precipitation has stopped and by no means should the sky tap actually be turned off. Water means life and the more the better! Well, maybe not to the degree of causing floods and landslides but yes, a steady series of downpours will work out fine. I see that rain coming down to smack the leaves and as always, I can’t help but wonder, how do birds deal? What do they do when it rains for hours? Do they get out and forage or do the tanagers and Russet Antshrikes hunker down to conserve energy and wait for their window of respite? 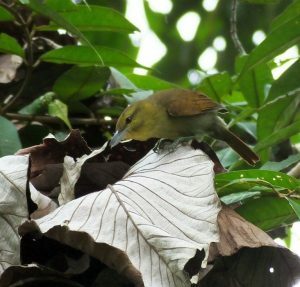 The Russet Antshrike is a common member of mixed flocks at many humid forest sites in Costa Rica, If you see a foliage-gleaner looking bird checking dead leaves in the canopy, it’s probably this species. I’m not sure what they do and it must vary by species but in general, it seems that most birds of forest and field get active when the heavy rains turn to mist; they seem to take advantage of that window when the pounding rain won’t drive them to the ground. As for raptors, it seems like they also take advantage of the almost dry window to use an exposed perch. Indeed, in such situations, I see Bicolored Hawk more often. Other birds can also perch in the open, some of them even doing so under the curtain of heavy tropical rains. It’s a good time to look for cotingas and not necessarily because you will find them, but because when it rains, there’s not a whole lot of other birding you can do. If it does pour, at least you can scope and scan the canopy from under a roof. Bicolored Hawk perched in the rain. This is basically what it takes to see some of the more esteemed and wanted members of this fantastic bird family. Although I would have to put the endangered and amazing Bare-necked Umbrellabird at the top of the awesome cotinga list for Costa Rica, the four classic cotingas are still very much desired and not just by those who travel to Costa Rica for birding. Those of us who live in Tiquicia want to see Snowy, Yellow-billed, Lovely, and Turquoise Cotingas just as badly and many a local birder has yet to lay eyes on any of these fab four. And even if you have admired the four classic canopy dwellers, they still get priority because you just can’t get enough of those cool birds. They look too weird and wonderful to not get excited about the prospect of seeing them, and, we just don’t see them that often. Such a cotinga situation keeps me looking for them, keeps my eyes on the highest points of trees, keeps me looking for trees with cotinga food. And, especially when I’m birding with special people who have yet to see these local beauties. Recently, I have kept an eye out for cotingas on the Caribbean slope, rain or shine (I guess mostly rain). Whereas most birders in Costa Rica get a good visual taste of cotingas at the Rincon bridge, the duo on the Caribbean side of the country are much more evasive. Head south of Limon and the Snowy becomes much less of an issue but the Lovely is always rare, no matter where you bring the binos. Given its eye-catching appearance, I guess the shining blue and purple thing should be rare. Yes. Shiny and blue as Cheyenne turquoise, ornamented with amethyst. I have only seen it twice, I’d like to see it again! Most of all, I’d like to admire the bird with someone who likewise feels that cotingas are fantastic. I have looked lately but not quite enough. 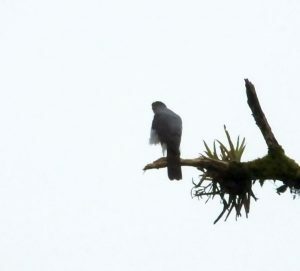 Checking the treetops in the Sarapiqui area has so far failed to turn up any bright white birds. I drive through the rain and steal glances at the tops of every tree in range. I’ve seen a few other things; parrots, oropendolas, sloths, and caracaras, but no Snowy Cotinga. In the Socorro area, I have made a few concerted attempts to find a Lovely. The extensive canopy views are right and so is the elevation and timing but the birds are rare and I haven’t put in the many hours likely necessary to connect. A good place to look for Lovely Cotingas. But, there’s hope in cotingaland! Although the Snowy has certainly declined in Sarapiqui, it’s still around, if we keep looking, we will find it perched high in the rain, hopefully drying in the sun. As for the Lovely, I did notice fig trees beginning to fruit around Socorro including one massive tree that might even be hosting a living doveish jewel as I write this. I hope to check it tomorrow. I won’t be able to spend hours watching and waiting for the cotinga but the blue and purple bird has to be visiting that tree at some point, maybe even calling it its new temporary home. I’ll be there to check it, at least for a bit. If I see it, I’ll share the gen. on Facebook, Whatsapp, and Twitter because everyone should have a chance to see a cotinga, especially one of the lovely kind. Want to learn more about finding cotingas and the best places to see them in Costa Rica? 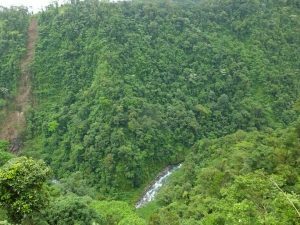 Support this blog by purchasing the 700 page plus e-book, How to See, Find, and Identify Birds in Costa Rica.